In the beginning of the 1990s, Mr. Lordi played in a small band from Rovaniemi. He left the band when the other members didn't agree with the introduction of theatrical elements and KISS-style rock. Mr. Lordi started producing demos under the name Lordi in 1991 and continued to do so for a few years. The rest of the band members met each other for first time in 1996 in Stockholm, where they had gone to see KISS perform. From the very beginning, they wanted their band to perform with spectacular pyrotechnics, 'monster style'. This, together with their masked image made several recording companies turn the band down, some saying that they should play black metal if they wear masks. Finally, the BMG recording company accepted them and their first album, Get Heavy, sold 40 000 copies in Finland. The monster masks and costumes the band use are made of foam latex. The masks were first cast and then glued together piece by piece. Mr. Lordi mentioned that their suits still have some original pieces from 1996. He has also said that the suits cost them "a few hundred euros." The band members do each others' makeup. 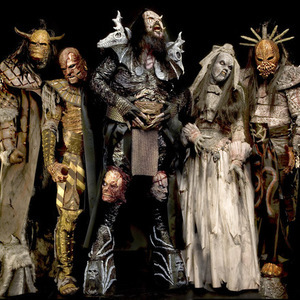 The monster costumes are such an integral part of Lordi's publicity image that they refuse to be photographed or even interviewed without them, even if in some cases it leads to their own discomfort. In a brief segment on the BBC reporting about the band attending the Eurovision Song Contest 2006, they were shown lounging beside the pool in full sunlight, while wearing their costumes. During the segment, Lordi remarked that the costumes and the heat did not mix. Lordi have stated their costumes have been inspired by KISS. The costumes have also drawn comparisons to the shock rock group GWAR, who wear similar foam latex monster outfits, even though their musical styles are quite different. Despite the band's strict approach in relation to their costumes, and due to their newfound success, multiple newspapers began publishing photos of the band members without makeup. On March 15, 2006, the Finnish tabloid Ilta-Sanomat published a photograph of Mr. Lordi in civilian clothing, with his face partially showing. Lordi has called this an insult toward them, and an attempt to destroy the "monster image" they have worked for ten years to create. On May 22, 2006, the Daily Mail published what was believed to be an old picture of the band without their makeup or masks. It was later revealed that the band in the photo was actually Children of Bodom, a different band altogether. This was acknowledged on Children of Bodom's official website. The photograph did feature Erna Siikavirta, who went on to join Lordi as Enary, the band's keyboard player. However, Enary left Lordi in 2005, well before their victory at Eurovision, replaced by Awa. On the same day, Bild-Zeitung, a German tabloid, published what they claimed was a photograph of Mr. Lordi without his mask in its section "Bild Uncovered" with the German headline "He is the Grand Prix Monster: All of Germany discusses the Ugliest Winners of all Time". Later many other European tabloids and newspapers have published the same or similar photographs. On 24 May 2006, the Finnish tabloid magazine 7 P?iv?? published a picture of Lordi's face on the front page, and two days later another tabloid, Katso!, published unmasked pictures of the other four band members. Both magazines were heavily criticised by their readers for publishing these pictures, which led to swift apologies from both magazines and promises not to publish unmasked pictures of Lordi any more. On 26 May 2006, video footage was shown on television in Lithuania. It featured four men and one woman, dressed in black, sitting by the table at the airport in Athens. After a few seconds, Heikki Paasonen (the Eurovision Finnish commentator) in a black Lordi shirt came and stood in front of the camera, covering the view. Lordi represented Finland in the Eurovision Song Contest 2006 finals with the song "Hard Rock Hallelujah" after getting through the semi-finals. The band won by a significant margin, scoring 292 points, 44 points over second placed Dima Bilan, representing Russia with the song "Never Let You Go". Having been voted for by all countries except Albania, Armenia and Monaco, Lordi scored the highest number of points for any entry in any Eurovision Song Contest to date. They received 12 points from eight countries: Denmark, Estonia, Greece, Iceland, Norway, Poland, Sweden and the UK. Coincidentally, Lordi also scored 292 points in the semi-final held two days earlier. The choice of Lordi to represent Finland spawned some controversy in both Finland and Greece. In Finland the choice was criticised by some and a group of religious leaders went as far as calling President Halonen to veto their entry. In Greece, a number of organisations were trying to stop Lordi from competing. The Greek restaurant and bar owners' union President, Mrs. Niki Constantinou made a public plea directed to the people of Finland and Greece to not allow Lordi to perform in the contest, claiming the group is satanist. Three other organisations in Greece initiated legal action against Lordi. Lordi himself responded to the accusations and strictly denied satanism. He said a satanist group would not write songs such as "Hard Rock Hallelujah" or "Devil is a Loser". Despite, or maybe due to, the controversy, Greece ended up awarding Lordi 12 points, the highest possible, in the contest final. Some speculate this to be a backlash from Greek young people against the conservative elements in their country who had criticized Lordi. Since prior to Eurovision, Lordi has been incorrectly identified - particularly by the press - as a death metal band. To celebrate their recent victory in the Eurovision Song Contest, Lordi held a public, free, open-air concert in the Market Square in Helsinki, Finland, on 26 May 2006. The band actually implicitly promised this concert to Finns during the scoring in the Eurovision final in Athens, as it became more and more clear they would win, by holding up a sign saying "Torilla tavataan!" ("See you at the [market] square!") in front of the TV cameras. "Torilla tavataan" is a Finnish inside joke and pep slogan for remarkable (mostly sports related) feats. Its origins date back to 1995 when Finland won its first ever Ice Hockey World Championship. The medal and the Ice Hockey team was celebrated by tens of thousands of people on the same market square to which Lordi referred. Before the Championship celebrations such a mass gathering of people to celebrate mere sports heroes had never happened before. So practically every Finn knows the slogan and its implications. At the concert, President of Finland Tarja Halonen made an official appearance to give Lordi a bronze key flag award for exemplary Finnish work. The concert was reported to have been attended by over 90 thousand people from all over Finland and even other countries, some even on their first ever trip to Helsinki. The concert was the biggest public event to that day in Helsinki. On this occasion, the world record for most people ever to sing karaoke was attempted by approximately 80,000 people, singing Hard Rock Hallelujah. The previous record was held by 50,000 Irish rugby fans. There were lots of discussions in Athens among the media and fans who would be the winner of the 51st Eurovision Song Contest. Sweden, represented by Carola and her song Invincible, was named very often. The singer had already won the Eurovision Song Contest in1991 and wanted to be the second person on earth to win it twice. Another hotly tipped winner was Russian heartthrob Dima Bilan, who had already tried to represent Russia the year before. German group Texas Lightning did well in at the bookmakers with their refreshing pop-country song No No Never, but the song only managed to end up at a disappointing 14th place. Anna Vissi, the Greek pop queen who had already entered the contests of 1980 (for Greece) and 1982 (for Cyprus) had high hopes as well to win the competition with her dramatic performance of Everything. However, not many experts expected the masked hardrockers Lordi to get the trophy. With their Hard Rock Hallelujah and their performance filled with spectacular pyrotechnical effects, the Finns managed to win the contest with 292 points. Funnily enough, they had the exact same score in the Semi-Final! These 292 points are the highest amount of points ever achieved in a Eurovision Song Contest to date. Lordi went on to have lots of success with their song which made the top 10 in dozens of European charts. 2006 saw some rule changes in the voting of the Eurovision Song Contest Final. Not all points were read out by the national spokespersons any longer as the marks from 1 point till 7 points were automatically beamed onto the screen, and just the three highest votes were still announced by the national spokespersons. The reason for this was that the voting in the previous years seemed too long, and with this rule change, the organizers wanted to streamline the show. Lordi's drummer, Kita, left the band on the 4th October 2010. He was then replaced by Otus.